The Skeleton Tourbillon watch is presented in a polished round case of 18 carat rose gold. The case diameter is 44 mm, water resistant - 30 meters. 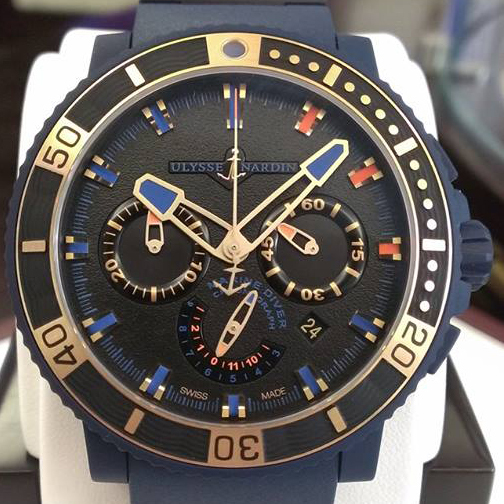 Placed at the 3 o’clock position, the crown is adorned with the Ulysse Nardin’s logo. The whole dial is skeletonized, black Roman numerals and hour markers are located on its flange. Indication of hours and minutes is carried out by means of the two central partially skeletonized blued hands. At the 6 o’clock position is the tourbillon carriage, at the 12 o'clock position - a large winding barrel with the brand’s name and power reserve. An anti-reflective sapphire crystal protects the dial, it is also installed on the backside of the case. The original novelty is collected on the base of the skeletonized caliber with a manufacturing manual winding movement Ulysse Nardin UN170. The mechanism is compiled on the 23 jewels, has a frequency of 18000 vibrations per hour, power reserve of 170 hours, display function of hours, minutes, tourbillon. The caliber is perfectly trimmed and decorated. The model comes on a leather strap with a clasp in 18-carat pink gold or platinum. The novelty Skeleton Tourbillon by Ulysse Nardin is released in a limited edition: 99 pieces in 18-carat rose gold and 99 pieces in platinum.